Professional football is coming to the Pasadena area in the spring. 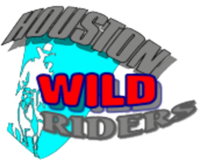 The Houston Wild Riders, one of the expansion teams in the National Indoor Football League (NIFL), will begin play in the spring of 2007. Few details are available as the present. What is known is that they will play their games at the Pasadena Convention Center, located on Spencer Highway in Pasadena. They are assigned to the Pacific Conference of the NIFL, which consists of the North, California, and South Divisions. Their team colors will be blue, gray, and red. Houston will be in the South Division with the Beaumont Drillers, Fort Worth Sixers, and the San Antonio Player Haters. Beaumont played in the league in 2006, reaching the league championship playoffs, losing in the first round to the Katy Copperheads 55-21. Katy has since left the NIFL and moved to the Arena Football League 2. Fort Worth and San Antonio will also begin their first year of play in the league in 2007. Fort Worth will play its home games at the Fort Worth Stock Yards while San Antonio will play at the San Antonio Rose Palace. Beaumont will continue to play in Ford Arena in Beaumont. The West soundly defeated the East 24-7 in the 2007 U.S. Army All American Bowl, played in the Alamodome in San Antonio, Texas. Linebacker Chris Gallipo from Anaheim, California was selected as the game's Most Valuable Player, receiving the Pete Hawkins Trophy. TexSport Publications was on hand in San Antonio to bring you all the action. Please click to http://texsportpub.com/allamericanbowl.html for the details. Now that the Houston Texans' 2006 season is completed, everyone is asking or thinking the same thing. What do the Texans do about David Carr? That is not an easy question. The question does not have an easy answer. Ask any fan of the Texans and you will get an equal amount of different answers. Any of their various answers could be a plausible answer to the above question. Some out there thought the Texans should have drafted Vince Young. Others felt that the smart choice would have been Reggie Bush. Whether the made the right choice during the 2006 draft is not the issue right now. Their main focus should be to get the best athlete they can to help them in the position they need the most help. My thought on the matter may be an idea that the Texans should consider. 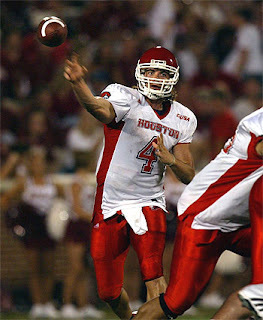 My idea: draft and sign University of Houston quarterback Kevin Kolb. He is a local favorite and would put people in the seats. 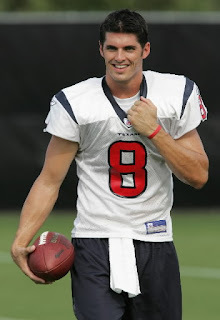 He is a good quarterback and would be a definite asset to the Texans. If the Texans didn't start him right away, he would have time to develop. He could learn the offensive scheme and, I feel, would be a big help to the Texans. This is just a thought from another person with an opinion.